Hard water can significantly detract from the overall flavor of your coffee, but that can all too easily be taken care of with the Curtis 10" Water Filter Assembly Complete. This filtration system will effectively clean and descale your water tank, removing sedimentation, scale, and chlorine. Where some filters are unable to provide a descaling solution to your tank, this filter will pick up every inch of slack and provide a fully clean environment for your water and tank. The Curtis 10" can filter 10,000 gallons of water before needing to be changed and can operate under a maximum temperature of 100 degrees Fahrenheit. Set to a micron rating of 10, this filter will guard against any contaminants over 10 microns in size while still allowing for a nice water flow-rate at 1.65 gallons per minute. Did we mention Wilbur Curtis will fully assemble this filtration system for you? Because they absolutely will; in fact, it's a recommended perk. Set your sights high, and support your coffee to meet its tip-top flavor potential with filtered water! Micron Rating of 10 - Nothing over 10 microns is getting through the Curtis 10" Water Filter Assembly Complete. Filter out those sneaky bacteria before they filter you! Or, at least... before they make your water taste funny. 1.65 GPM - Efficient filtering paired with a steady flow of water. 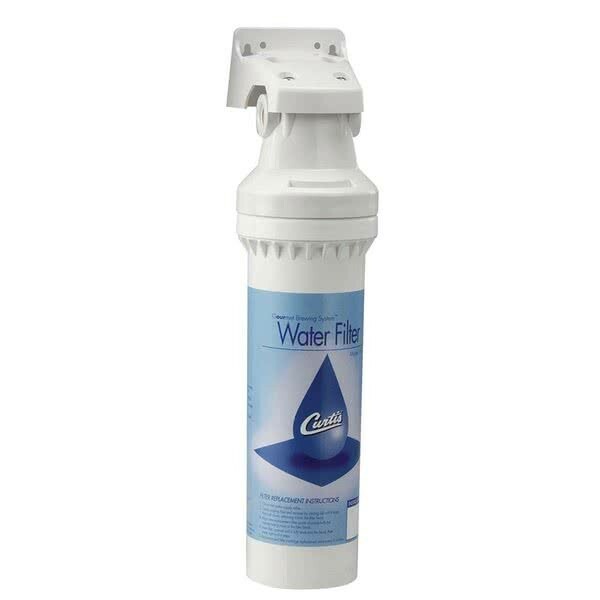 The Curtis 10" filter will keep your water tasting clean without compromising your speed of output. 125 PSI - Supports a maximum water pressure of 125 Pounds per Square Inch. Filters Scaling, Sediment, and Clorine - Built for both maintenance and improved quality, this filter will increase the longevity of your tank through its descaling ability and decrease the hardness of your water as it filters. 10,000 Gallon Capacity - This workhorse can filter 10 thousand gallons before needing a replacement. Wilbur Curtis filter assembly - Ensure that your filter is installed correctly, and take full advantage of this recommendation to have your filter professionally assembled.